Rinker’s brand new Captiva 216 is so new that, not only did it not make it into Rinker’s 2011 main brochure, but very little printed information about it was even available at the Toronto International Boat Show to accompany the one sparkling example of the model on display there. BoatDealers.ca was excited and fortunate to be one of the first media to review this extremely sharp looking, well thought out, and beautifully detailed new bowrider. Rinker, part of the Nautic Global Group, has been building boats for over sixty-five years and for 2011, offers a full range of twenty-two models of boats in four series; eight models of bowriders from 18 to 30-feet; three deckboats from 23 to 27-feet; four cuddy cabins from 22 to 30-feet; and seven models of express cruisers from 23 to 40-feet. Rinker hired a new designer, Kelly Payne, to pen this new Captiva 216 and to eventually extend the concepts presented in this new boat to other models in the line-up. He started with a clean sheet and created an entirely new hull, running surface, and deck, and the results are both noticeable and remarkable. 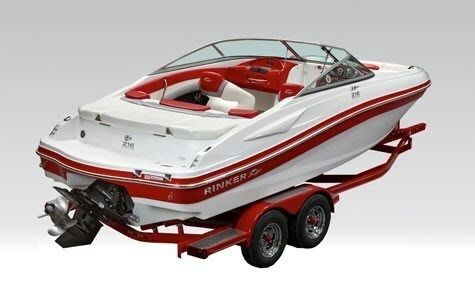 “Introducing the new face of Rinker” is the very apt description given to the all-new Captiva 216. What is noticeable on the outside is what Rinker calls the “wide forward footprint” where the beam at the gunnels extends forward from the transom to just ahead of the windshield base before it tapers inward to the bow. This feature provides noticeably increased room in the cockpit plus allows a wider walk-thru from the cockpit to the bow seating area. Interior storage areas are similarly increased as a result. The most obvious improvements are found in the 216’s interior with the use of new textures and soft feel to the upholstered surfaces plus considerable attention given to finishing details throughout the boat. Most noticeable of all is the available colour co-ordination of the choice of hull accent colour to the entire interior detailing of the boat, including not only seating and side coaming upholstery accenting, but uniquely and most remarkably, the use of the same matching colours for both the driver’s and passenger’s helm! A total of eight hull accent, and therefore interior accenting, colours are available. The large, integrated swim platform includes a stainless steel boarding ladder and is sufficiently close to the waterline to make the tending to watersports activities such as skiing, or wakeboarding, or tubing easy to facilitate. A flip-up starboard section of the upholstered sunpad eases entry from this swim platform to the cockpit. Berber carpet is standard on the cockpit sole and a massive, unique keyhole-shaped in-floor storage compartment makes the loading and retrieval of watersports accessories a breeze. Adjustable bucket seats with flip-up forward bolsters are standard as is a tilt wheel, full instrumentation, and an in-dash depth finder. Printed performance figures were not available at the time, but a Rinker dealer who had tested the Captiva 216 informed BoatDealers.ca that with a MerCruiser 4.3L MPI and Bravo III outdrive, it topped out at a remarkable 47 mph, and with a 5.0L MPI and Bravo III, the boat achieved 52 mph. Both MerCruiser and Volvo Penta sterndrive power is available. The Captiva 216 is a remarkable new boat and a new look both for Rinker and for its bowrider series. If you were not fortunate enough to catch a peek of it at the Toronto show, do yourself a favour and catch it at a show nearer to you or at one of your local Rinker dealers.